Registration for membership lasts until the end of the academic year, so you will need to renew your membership each September. ​Registration opens September 1st and closes May 31st of each year. ​*All registrations are done through the Ritchie Center, NOT PioneerWeb. All students automatically have an account. You MUST be on your student Ritchie Center Account to be able to register for anything for Alpine Club. Visit our university website below and click on Register Online. **Not your PioneerWeb credentials. DO NOT USE YOUR PIONEERWEB PASSWORD!!! 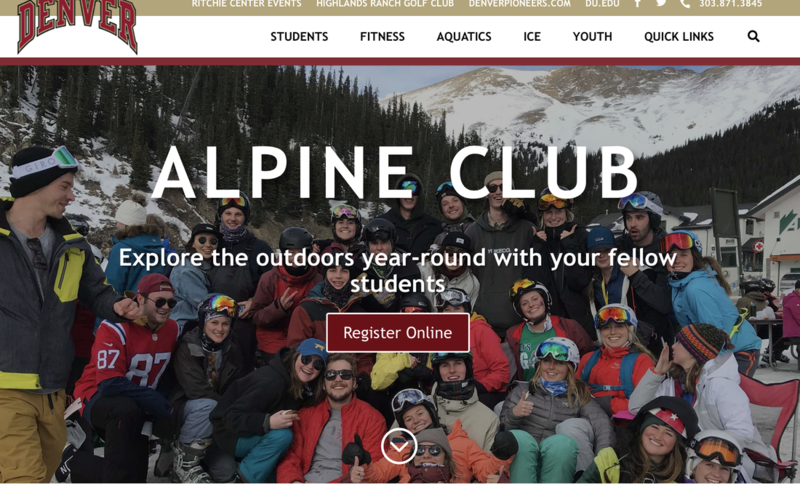 If redirected, select the "PROGRAMS" tab at the top of the page, then "Alpine Club" beneath the Student Programs section. If logged in, you should see a green "+" beside the option “Alpine Club” (purchase a membership) click on "Add To Cart". Fill out all the remaining info, and fill out credit/debit card numbers to purchase your membership! ​See a red "X" instead of a green "+" by the item you are trying to register for? That means you aren't logged in OR registration is not open yet! Scroll over to the buttons on the right to see more information. If you try the wrong password too many times unsuccessfully, you will receive an error that you are now locked out of your account. You may contact clubIMsports@du.edu to have them unlock your RecTrac account. Please provide them your name and DU ID number in your email. They will email you back as soon as it is unlocked. You can also call the Coors Fitness Center Front Desk at 303.871.3845 during their hours of operation to have them unlock your RecTrac account! If you have any other questions, please email us at alpine.du@gmail.com. Memberships are not refundable.